To Dog With Love: Dog vs. Cat: Who's a Bigger Part of Your Family? Dog vs. Cat: Who's a Bigger Part of Your Family? I don't know about you, but I love pouring over research and statistics, especially when it comes to pet owners. And this week, Mintel, a leading market research company, unveiled some new stats about pets. Not surprisingly, the findings show that pets are considered members of the family to nearly nine out of 10 owners. But while nearly all dog owners (90 percent) consider their dog a member of the family a slightly smaller number of cat owners (83 percent) consider their feline pals family members. Why are dogs so entrenched in our family life? Maybe it's because seven out of 10 pet owners feel their dog understands their feelings better than most people or because more than half (54 percent) say they share similar personality traits with their dog. Whatever the reason, the good news for pets of all kinds is that they continue to get the royal treatment as spending of pet related products and services continues to grow. Pet owners are spending most on pet food ($18.1 billion in 2011) with veterinary services coming in second, generating $12 billion annually. What's great news is that most pet owners (90 percent) are paying close attention to the health and behavior of their dog/cat and are taking them for regular checkups. We're certainly doing our part to contribute to the pet industry spend! 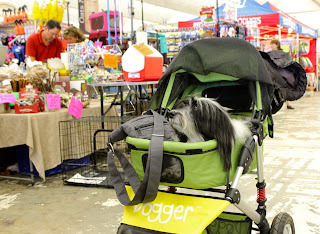 ... Vet bills top the list lately with food and supplements coming in a close second and then there are the other essentials like strollers (! ), toys, treats, chews, crates, pens, beds and more accessories than I can count! What do you spend your pet budget on? And do you consider your pet a part of the family? Do they understand you better than anyone?! I certainly consider my four kitties part of the family - just ask my daughter and she'll confirm! The bulk of my pet-related purchases are for food and litter (weekly), followed by toys, treats and meds (when needed). They're not cheap, but they're definitely worth it! I agree! Definitely worth it! For my guys, it's food/supplements. A super high quality diet helps to keep away the extra vets bills. Probably even more is spent on my weekly agility class and agility trial entry fees. Oh that!! I forgot about the expense of agility entry fees and training! Add that to my list too! Are you kidding? We're their BABIES. ANd they don't spend NEARLY enough on treats and toys. Just meowing. Well, there are no cats here anymore, but our cats tended to be less concerned about being with us, unless it was on their terms. The dogs want to be with us and go out with us at any opportunity. It wasn't that we didn't consider the cats members of our family when we had them, they just were a bit more aloof. Heck, our bird was considered a member of the family when we had her, too, and that was a different sort of relationship, too. We are sticking with dogs, I am not a cat person. Yes, our guys are definitely members of the family. We spend more on them than ourselves. We are a household of cats and dogs and we are all equally loved and part of the family. And Mommy says we are all very spoiled. We thinks spoiled means LOVED. We all adore our Mommy, Daddy and the boys and they adores us right back.